After breakfast drive to Sariska. On arrival transfer to hotel. Later leave for safari inside the Sariska Tiger Reserve. The tiger land in Rajasthan. In this 480 sq. km. sanctuary the grassy glades and woodland covers are excellent niches for the prey species, sambhar, chital, nilgai, four horned antelope, wild boar and common langur. The ruins of 9th temples of Garh-Rajor of the 10th &11th centuries remind of the past glories of the area. Overnight at hotel. After breakfast visit Amer Fort. Ascend by painted elephant / Jeep Safari up to fort with its huge gateways and pillared pavilions. It has a marble Palace, Temple of victory and Sheesh Mahal (Hall of Mirrors). .Afternoon visit City Palace and Museum, Hawa Mahal (Palace of winds), Jantar Mantar, Observatory. Overnight at hotel. After breakfast drive to Ranthambore National Park situated 14 Kms. East of Sawai Madhopur. On arrival transfer to hotel. Afternoon visit the park. Overnight at hotel. After breakfast visit inside the Park. Here Sambhar, chital, chinkara, nigai, wild boar and common langur provide a spectrum of prey range for the resident tigers and their copredators leopard & jackal. Sloth bear & hyena also live in this unique habitat of dry deciduous forests. Overnight at hotel. After breakfast drive to Agra, the city of Taj, enroute you can visit Fatehpur Sikhri the old Mughal capital still preserved in good condition. On arrival transfer to hotel. 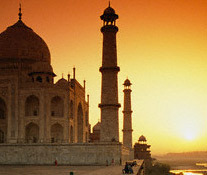 Evening free for leisure or you can visit local bazaars of Agra. Overnight at hotel. After breakfast sightseeing tour to Agra visiting the magnificent Taj Mahal - The Monument of love, built by Mughal Emperor Shahjahan in 1630 to enshrine the mortal remains of his queen Mumtaj Mahal. 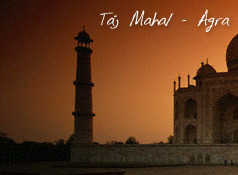 Also visit Agra Fort. Later in the afternoon drive to Delhi. En-route visit Sikandra: On arrival at Delhi transfer to Airport to connect flight for onward destination.